(Nanowerk News) The entire semiconductor industry, not to mention Silicon Valley, is built on the propensity of electrons in silicon to get kicked out of their atomic shells and become free. These mobile electrons are routed and switched though transistors, carrying the digital information that characterizes our age. An international team of physicists and chemists based at the University of California, Berkeley, has for the first time taken snapshots of this ephemeral event using attosecond pulses of soft x-ray light lasting only a few billionths of a billionth of a second. 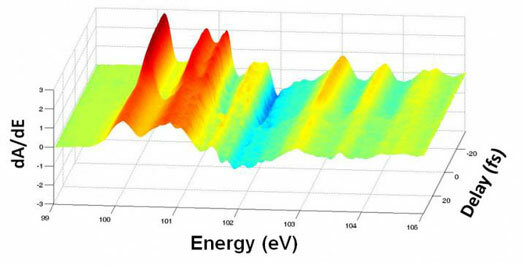 Leone, his UC Berkeley colleagues and collaborators from the Ludwig-Maximilians Universität in Munich, Germany, the University of Tsukuba, Japan, and the Molecular Foundry at the Department of Energy's Lawrence Berkeley National Laboratory report their achievement in the Dec. 12 issue of the journal Science ("Attosecond band-gap dynamics in silicon"). In analyzing their data, the team found clear indications that this hypothesis is true. 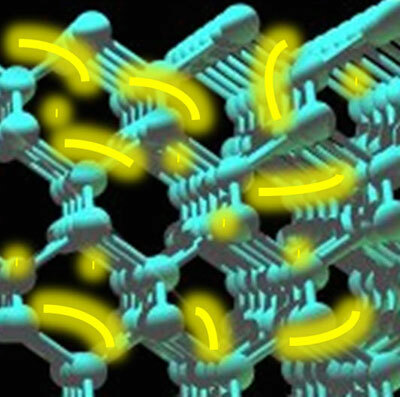 They showed that initially, only the electrons react to the impinging light while the atomic lattice remains unaffected. Long after the excitation laser pulse has left the sample - some 60 femtoseconds later - they observed the onset of a collective movement of the atoms, that is, phonons. This is near the 64 femtosecond period of the fastest lattice vibrations.